Eric Prydz is back in the studio — releasing his latest Pryda track “Power Drive” on Pryda Recordings today. 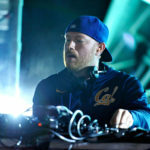 “Power Drive” is a somewhat of a slow burner, employing many of Prydz’s usual lush production tricks to build and break through dramatic and sinister melodies. Pryda may be taking a page out of Cirez D’s book on this one, but it’s another clear win for the Pryda camp. Whether you’re tastes fall in the realms of progressive house, big room, or tech, “Power Drive” will satisfy your senses.